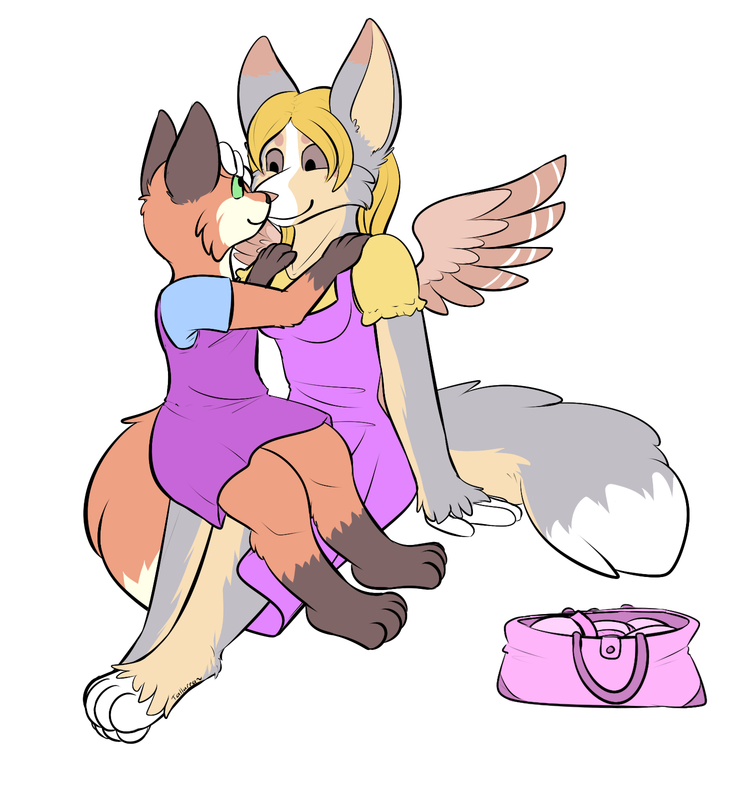 This is a commission by Tallara over on FA of Charlie with the winged fox caretaker Serenity at day care together, with the day care's owner promising to Charlie that she'd let herself be little as the cubs she took care of. Serenity didn't understand why Charlie liked being in jumper dress all of the time. Though he liked pink diapers and all, he really wasn't a sissy fox. She surmised that it was because of the convenience of easy access for diaper changes as she helped the kit with his mid-morning change. After she finished taking care of him though, Charlie softly gazed at the caretaker, smiling at her as she sat down on the playroom floor. "Charlie, there seems to be something on your mind," Serenity smiled softly, "Wanna tell a girl what you're thinking?" "Well," Charlie blushed softly, "I see you peeking into my diaper bag all the time and...are you that curious about my diapers? I mean for a boy who wears pink diapers?" Serenity blushed a bit, but nodded in agreement. "O-okay," Serenity mumbled, "Even though I'm the big girl here...I am jealous and I wish I could get myself to try them on." "Silly Serenity," Charlie giggled as he hugged her, "They got pairs that fit you good." "T-they do?" she asked shyly, "But...you'd think it'd be okay?" "Someone's gotta be the big girl, right?" Charlie nodded, "Since Ashley doesn't know how to and so most of the others." "Well, yeah," she answered, "But I want to be like you...really do." "Is there something you'd like to see me do?" Charlie asked sweetly. "There is...don't worry it's nothing icky or anything, but," Serenity blushed, "I'd like to train someone to help me run the place...and help us with the boys." "Oh Serenity," Charlie teased her, "I thought the boys liked playing with you." "But you know how to connect with them better," Serenity nodded, "Though...I'd really like you to help the transformed cubs adjust. Ones just like you." Charlie blushed as Serenity had a point - none of them were transformed; they were born as anthro furries. Charlie knew the pain of adjustment and becoming acclimated to their new lives so he could help them out like James helped him out. "Serenity," Charlie cooed softly, "I think you'd like me to be around here more, don't you?" "Well, if you're helping our kiddos, I'd like you to help me diaper train," she blushed and cooed back, "You decide when I'm ready." "Is this...what Miss Serenity wants?" Charlie asked shyly. "I do, Charlie," Serenity cooed softly, "Guess it's my turn to have someone watch over me." Charlie nodded in agreement as the two hugged each other. It was strange that Serenity wanted such a role reversal, but Charlie didn't mind if it was constructive and helped Serenity bond with the other cubs. A big thanks for a cute commission.